At Landshut the Isar river was spanned by two bridges with a small island in the center. Hiller had positioned cavalry outposts to the north of the town. 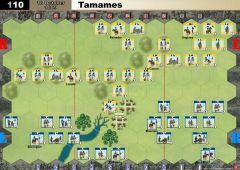 His main force was deployed in Landshut and to the south on higher ground. Early in the morning Hiller was informed that a French force (57,000 men) had crossed the Isar upstream at Moosburg. Masséna led this force. now faced with attacking across the smoldering bridge. Napoleon ordered his aide General Georges Mouton (later comte de Lobau) to assume command of the attacking grenadiers of the 17th Line. In the face of heavy Austrian fire from all sides, Mouton ordered his men to attack without firing their muskets. 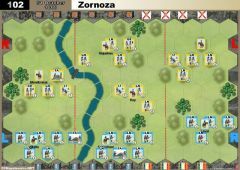 The grenadiers reached the gateway and broke it down, allowing Bavarian troops to quickly reinforce the breach.The fighting now continued in the streets of Landshut itself. However the French had crossed a bridge immediately to the west of the town and were now entering Landshut from the south. 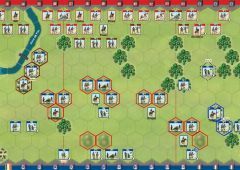 The Austrian player may play a scout card for 1 victory banner instead of playing it for its printed effects. 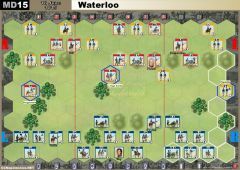 This may be done once per section during the game, which represents movement of command and supplies from the area towards Neumarkt. The Austrian may therefore gain 3 victory banners in this fashion per game. sorry, I had to edit what I just posted. I misspoke. I think we can simplify the scenario by replacing special rule four with "time pressure rules are against the French "
Agree with Mark. I thought the game drifted into a tedious siege-like exercise. A change might be to increase the banners for victory to 8 or 9, but allow the Austrians to gain up to 2 banners per section for Scout cards. Might push the French a bit more. To be honest, I don't know much about this battle, so I don't know whether this would force a relatively ahistorical approach. 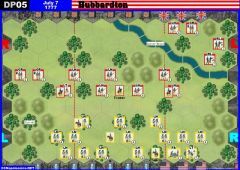 Had we played something along these lines though in the game Mark describes, I would have had to shift my forces to the right flank and press home the attack there instead of playing a waiting game on the left. 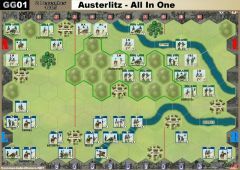 As it was I had an artillery cannister card ready for any sortie the Austrians might have made out of Landshut itself. It seemed impossible for me to lose in the long run. Played this scenario yesterday with the Exp. 5 rules, a 75 card deck and the Tactics cards. Lannes started 5 Tactics cards, Hiller 2 Tactics cards. 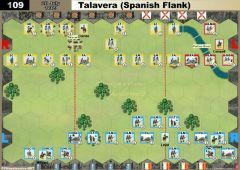 The initial French attack in the Right was repulsed for the loss of a French cavalry, and lucky not to lose both cavalry. 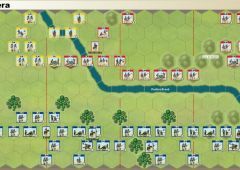 The French then withdrew back across the river on this flank, which remained mostly dormant for the rest of the game. 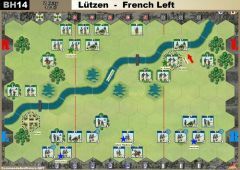 On the French left, the Austrians tried to evacuate their units to Landshut, which was mostly achieved, but the Lancers were trapped and destroyed. By this stage the Austrians had played Scouts on Left and Centre, and led 4-1. Shortly after the Scout Right card was played (5-1) and the time pressure was off. 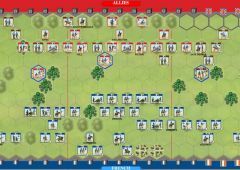 The French artillery was then brought up and conducted a prolonged (about 1 hour of game time) battering of any visible Austrians, eventually killing 1 Austrian artillery and 1 Austrian Line, and reducing several other units. 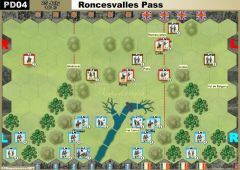 Any attempt by either side to cross the river and bring matters to a head resulted in casualties, and the French were luckier in converting losses to banners. (2 banners, the Austrian Light and the remaining cavalry). 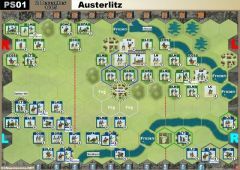 With no mobility, the Austrians were on a certain, slow path to loss, and a final push from Landshut across the bridge to try and achieve victory was finished by Artillery Cannister. Whole game ran for over 2 hours, much of which was artillery fire. Without any time pressure, the French can just plink it out, and the Austrians have little in the way of offensive mobility to take the fight to the French. French win 7-5, with only 1 French unit lost. Seemed to me that Exp.5 has significantly changed the game for this scenario, though the underlying problem of no time pressure was always there. "The Austrian player may play a scout card for 1 victory banner instead of playing it for its printed effects. " Does this mean no orders are made? Interesting challlenge for the French who need to spend time manouvering given the 'pinch-points' for crossing the river.